Everyday on my twitter, instagram and facebook feeds I see little updates of people's advent calenders. A lot of these are of course chocolate, or beauty advent calenders or even calenders where you can put the treat in yourself. I have never actually had a chocolate advent calender and to be honest I don't really consider me missing out. My Dad always used to purchase the traditional advent calenders with the proper Christmas scene and me and my brother always used to take turns opening the doors until a couple of years ago. Before I get into this post I'd like to first of all mention that this isn't sponsored in anyway at all. I absolutely love these advent calenders and I have been using this website for a good few years now. It is just something I think a few of you reading this might enjoy. My Dad discovered a website called Jacquie Lawson. This is an amazing website which has incredible interactive e-cards. I still love the tradition of receiving and sending cards through the post but I just think this is incredible and beautiful. A couple of years ago they started adding different advent calenders to their selection and every year my Dad would download one to his computer and me and my brother would spend the next 24 days taking turns to see what it was. The calenders are so incredibly beautiful. As you can see from the photo at the beginning of this post I've chosen a market one this year but they have also got another one which as a Grand Edwardian House. 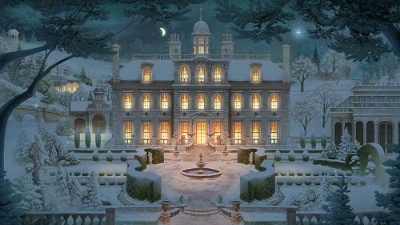 This is what it looks like below and it is so incredibly beautiful with the snow outside and all the lights lit up inside the house. We decided to go for the Edwardian house last year and it didn't disappoint. I would highly recommend it. I absolutely love these calenders. I love waking up in the morning and logging on and seeing what's next on the advent calender. There are 24/25 days on each calender and as you go through each day in the month you can click on it and see what's next. 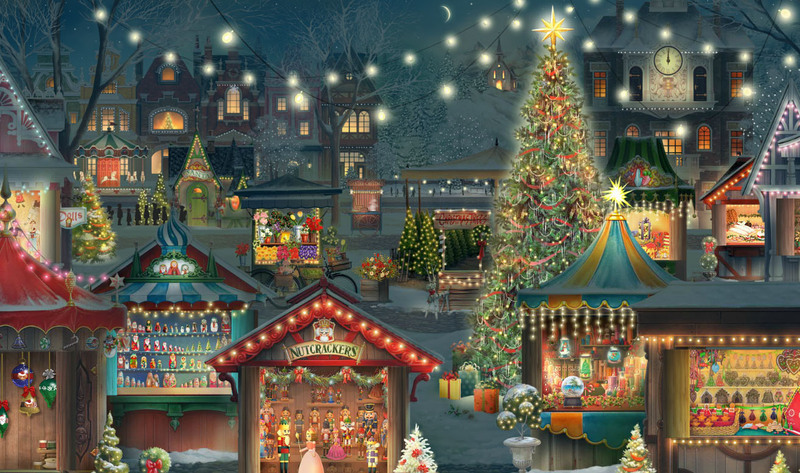 Normally it will be a little Christmas scene with very festive music and other days there will be interactive things for you to do such as decorating baubles to go on the tree, decorating the Christmas tree and even wrapping paper to go under the tree. On each calender there is something called 'Family Room' where you can go to your main room where it is like a living room with a Christmas tree and a fire place. There is normally a table in each of these rooms and on the tables there will be interactive things for you to do again such as creating your own snowflakes (which will fall down outside once you have finished creating them! ), christmassy puzzles, books where you can find out interesting facts about Christmas and even a marble game which by the way is incredibly challenging! Me and my Dad have both played it and tried to conquer it and we just cannot! I think these calenders would be absolutely perfect for children as well. What I love about these calenders is that you can't cheat and see what's next. So if you want to ruin it and go straight to 24 you cannot! I love that! They only have two calenders this year but in previous years they have had different themes. See the photos below to see what else they have had. 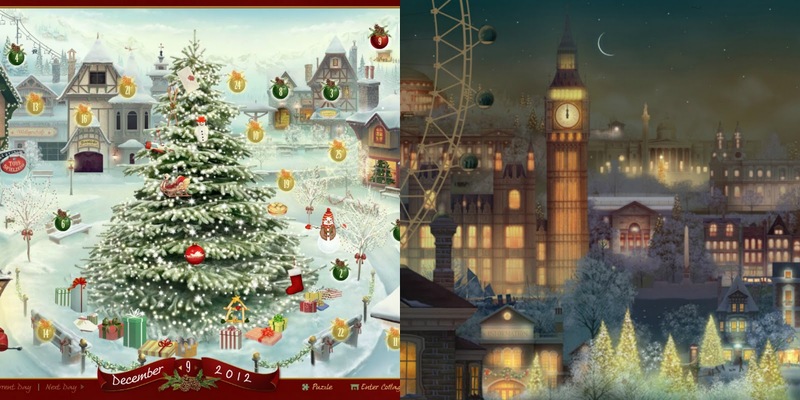 The first one I saw was just a normal Christmassy village and the next one was a beautiful London one. If you would like to purchase these advent calenders either this year (even though we are 12 days through now) or next year then all you have to do is sign up to the Jacquie Website. They offer you two different types of memberships one year which costs only £7.25 and two year membership which costs 11 years. I consider that an absolute bargain. Once you're signed up that is it, you don't need to worry about paying for anything. Throughout the year you can send unlimited e-cards to any one of your friends and family. All you need is their email address. You can send literally everything from birthdays to valentines to congratulations to even cards to just say hello! Pretty amazing! If you would like to purchase the advent calender then you do need to pay £2.50 but I consider that pretty amazing for what you get as these calenders really are incredible and so much more worth it than a measly chocolate calendar. (No offence to those of you who have chocolate ones haha if I didn't come across these I'd be using them as well!). So that's a bit of information about Jacquie Lawson. If you like the sound of this and wish to sign up then you can check the website out HERE. You are free to browse the website and even few all of e-cards if you are not sure. I reckon you will be pretty impressed! How are you counting down to Christmas this year?